There is always a seed from which the roots of journey begin to take shape. 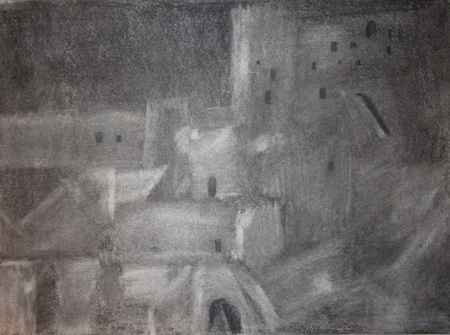 For me, the seeds of my art lay partly in a place that is still very near and dear: The Sassi of Matera, a series of Paleolithic cave dwellings still in habitation, in the southern region of Basilicata, Italy. As dusk falls here, the muted shifting colors in the sky are reflected on a brownish cream limestone terrain tinged with age, carrying within in stories of an untold past. Random lights, like crystals, are scattered across a labyrinthine facade, replete with dark openings; hinting at a presence silently watching the observer back. At fist encounter, the visitor feels at once awe struck and mystified. For this place is not like any other in Italy. I have traveled here often, with sketchbooks and watercolors in hand, trying to fathom how those without any architectural 'training' can make a place as dynamic, as beautiful, and as awe inspiring as this. It makes one wonder what it truly takes to design and build a meaningful place. Below are some sketches I did while visiting there; some in the quiet of night, some in the beauty of dawn, and some while sunlight beamed down upon me as I wandered, squinting yet wide eyed in thought, among the stone dwellings scattered along my path. I hope you have enjoyed this glimpse into some of my earliest sketches, done within one of my favorite travel destinations in Italy. 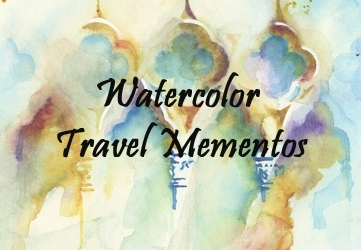 I also wanted to share a reminder of my Watercolor Travel Memento offering; a bespoke gift for yourself, for a loved one during the holidays, or to celebrate an anniversary. During this offer, complimentary shipping and gift wrapping will be made available on the limited number of commissions being offered.